Sonic Foundry wants to share the wealth. They've just launched Mediasite.com (www.mediasite.com), a searchable Web site that aggregates publicly available expert presentations from higher education, government, and corporate sectors. The idea is to link individuals to a growing database of expert rich media content. Debuting with more than 7,000 titles, the collection is based on, but not limited to, presentations that were recorded using Sonic Foundry's Mediasite recording technology. It includes topics ranging from the treatment of contagious diseases and general health-related issues to robotics, business start-ups, sociology, ethics, financial advice, and career advancement-a wide variety of both technical and general-interest topics. "Since we launched the Mediasite rich media communications technology just three years ago, customers around the world have been capturing thousands of hours of presentations for corporate, education, government, and public information use," says Rimas Buinevicius, chairman and CEO of Sonic Foundry. "Mediasite.com is the first step in bringing all of the publicly available presentations to the public through a single aggregated, searchable source." The site is based on free, on-demand access and uses a free Mediasite viewer window and the freely available Windows Media Player for viewing presentations. A simple search window and pull-down category menu allows users to narrow their search with keywords from presenter-defined metadata. 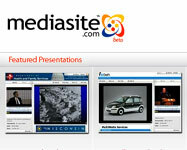 Mediasite.com will grow with both user submissions and presentations identified by Sonic Foundry's Web crawler. The system tests for completeness and technical quality, throwing out fragmented or broken presentations. Sonic Foundry plans to evolve the site based on user feedback, and is already considering ways to improve the search function and categorization of presentations.